Are you incorporating visual storytelling as part of your content marketing strategy? You should be. Even though classic storytelling has not gone out of style, consumers’ attention spans are less than that of a goldfish, causing visual storytelling to become a more critical aspect of content marketing. Posts with video attract three times more links than posts with text only, Moz reports, and posts that include images result in a whopping 650 percent more engagement than ones without, according to Adobe. The popularity of Snapchat and Instagram and the increasing emphasis on video, photos and livestreaming on Facebook are further proof that visuals are a vital component of a solid content marketing strategy. Their importance is only going to grow, too. By 2021, we will see an estimated 94 percent increase in video content internet traffic, according to a Cisco whitepaper. Also see this great post from OptinMonster on video marketing stats. What counts as visual content? A note about video: This type of content comes in a variety of formats. Brands may produce short videos on Instagram or Snapchat, or put up tutorials, product reviews, behind-the-scenes footage, or entertaining videos on Facebook, YouTube or Vimeo. It also includes livestreaming videos on Facebook and Periscope, which enable brands to connect with customers on a more personal level. If you need to step up production of visual content to remain competitive in a marketing landscape dominated by visuals, these tools will help your in-house or freelance creatives. 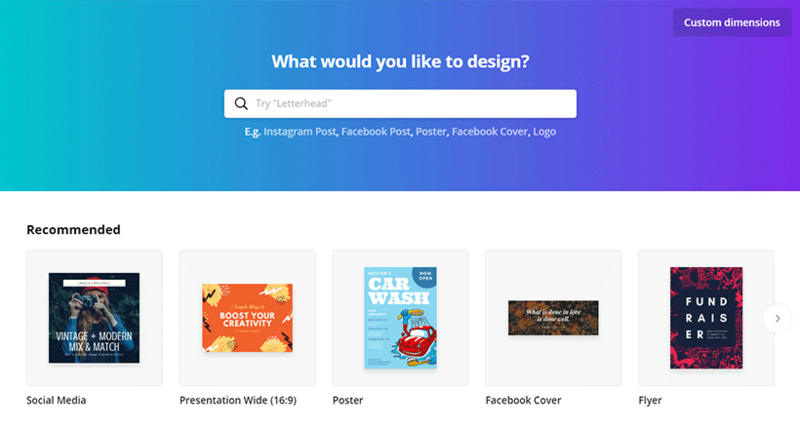 Canva is a simple-to-use tool for producing designs and documents for your company. Use it to create images for social media platforms like Facebook, Instagram, Pinterest, and Twitter. You can choose from a wide variety of logos, fonts, backgrounds, frames, and grids, and upload your own images. Canva is free, but premium elements will cost you $1 each. A paid option, called Canva for Work, is $9.95 per month if you pay annually and $12.95 if you pay on a month-to-month basis. With this, you can save your brand colors, fonts, and logos and organize your images into folders. Visme is an online tool for creating infographics, ebooks, presentations, reports, slideshows, banner ads and graphics for web content. You can make your content private, public, or password-protected, incorporate audio and video, and animate links and pictures. There are hundreds of fonts, thousands of icons, and millions of free images available on the platform. Even though Visme is newer to the scene than Canva, they’ve been developing their product very quickly, and have one of the more robust visual storytelling tools out there, hence they came out on top in our best in visual storytelling review when compared to Canva and Piktochart. It’s free for five projects per month, and you receive 100 MB of storage and the ability to download .jpgs and publish online. Other pricing options are $13 per month for 15 projects and 250 MB of storage, or $22 per month for unlimited projects and storage along with privacy, collaboration, HTML5 export, and analytics. 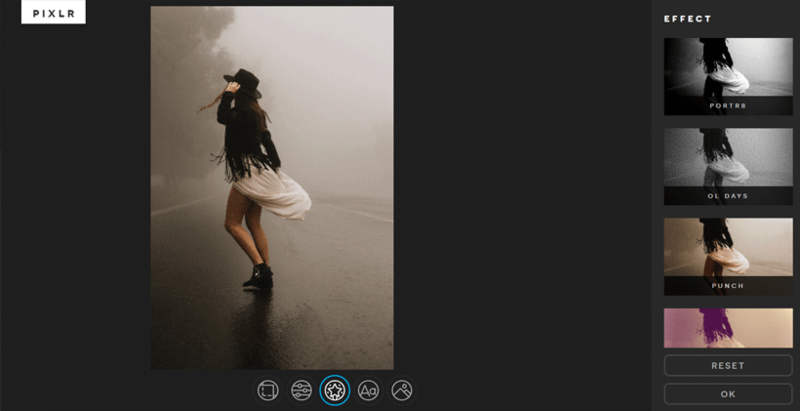 Pixlr is an online platform for photo editing. There is the Pixlr Editor tool, which is like Photoshop in that it lets you work in layers and digitally manipulate photos. The big difference with Photoshop, however, is that Pixlr is free, and lives in the cloud. This means you can access your account and projects from any computer and are not reliant on a locally installed version of Photoshop. Both Pixlr and Pixlr Express, a more limited edition that is easier to learn, are free, and all you need to do to get started is upload the photo you wish to work on. It’s an ideal platform for creating quick memes and graphics. 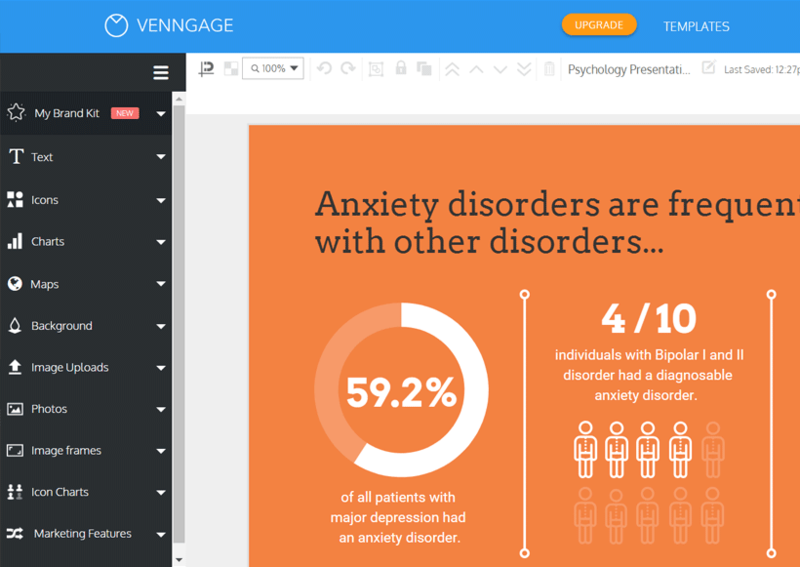 Venngage helps brands take their data and information and turn it into stunning and comprehensive graphics. They’re best for infographics, micrographics, and other data representing visualizations. The click-and-drag tool helps you easily generate data-driven visualizations in 3 easy steps: choose your template, import your data, and customize your design. You can try the platform for free. Starting at $39/month (paid yearly), you can receive unlimited access. The paid version also comes with a robust support package, including 1 on 1 consulting support, live training sessions, and access to a very active user community. WeVideo is a cloud-based video editor that enables multiple users to collaborate on a single project. It gives you transitions, green screen, and fast- and slow-motion options, and you can save videos to the cloud or your hard drive. Your footage is uploaded to a timeline, and it’s simple to add in any features that you may need. You can upload directly to different websites through the tool. The pricing ranges from free to $720 per year. In order to gain access to their stock videography package, where you can choose from 650k+ pieces of free video content, you’ll likely be best suited with their $216/year option. With the free option, you get 1 GB of storage and your video is watermarked, making your videos rather unusable. For the $216/year package, you get unlimited storage, unlimited projects and video exports, no watermark, and the ability to upload and download in 4K Ultra HD. Camtasia gives you the power to record what’s happening on your screen and overlay it with audio commentary. You can also add video effects to the recording such as text boxes, green screen, panning and zooming. Use it to create product demonstrations, tutorials and lessons. You can try Camtastia free for 30 days. If you’d like to purchase it, the company charges $199 for a single user license, with discounted rates for education and government. They also offer volume pricing. Facebook Live lets your brand livestream behind-the-scenes footage, product demonstrations, interviews and any other exclusive, live events you have going on. When you go live, you can interact with your audience through commenting and see how they’re reacting to your feed. There are filters and tools that let you write on top your video to make it even more fun. Those who watch your videos will have the chance to follow you and receive notifications anytime you go live. Facebook Live is free, but you may want to pay for ads via Facebook to advertise your live feed. Prices for ads vary. 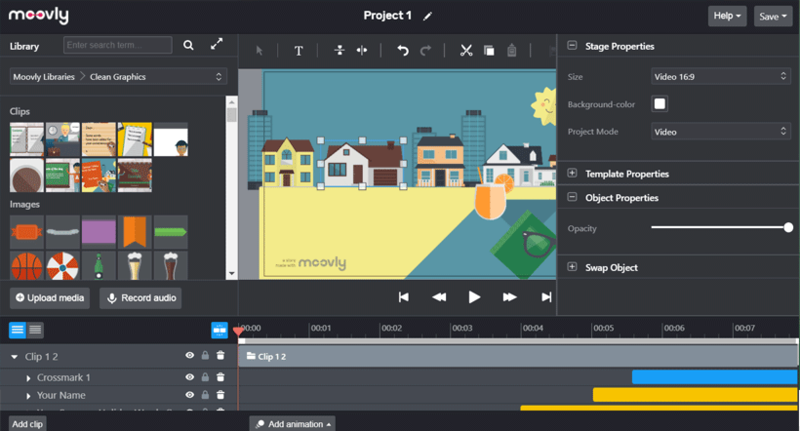 Moovly is online software for creating animated presentations and videos. With it, you can create ads, tutorials, and demonstrations for a variety of B2B and B2C purposes. There is a library of objects you can use, and all the assets are drag-and-drop. You can add in voiceover, and enlist the help of a Moovly professional for scriptwriting, animation and voiceover recording. The platform includes a number of pricing options that range from $25 per year, outside of a free trial version (that watermarks your videos). The $25 version comes with unlimited videos. The highest priced version gives you enterprise-level functionality such as group asset management, and license volume discounts. 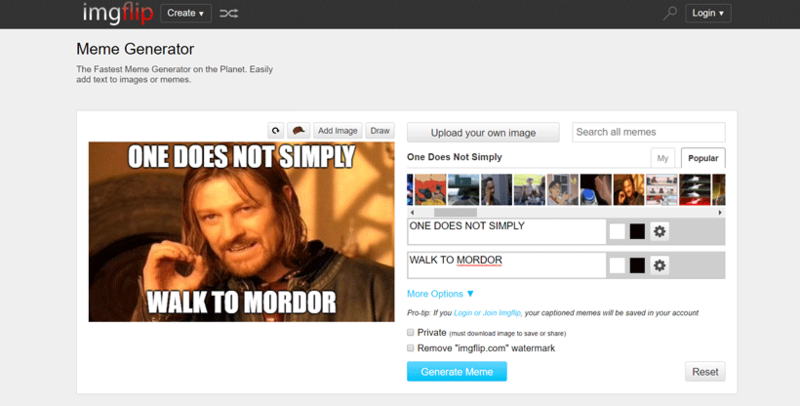 Imgflip Meme Generator is a simple tool to produce customized memes with popular meme images. If you don’t know what memes are currently trending, just log onto Imgflip and see for yourself. Add your own text as it relates to your brand’s messaging, and save it for upload. The downside with this free platform is that your meme will come out with an Imgflip watermark. To take it off, use Imgflip Pro, which is $9.95 per month and includes an animated GIF feature. Similar to WeVideo, Promo is a visual storytelling tool that allows you to easily spin out video content that you can use to garner more eyes on your brand. A deceptively easy to use tool, Promo allows you to select a video (from their huge collection), select music, and add in titles. Voila! In less than 30 minutes you can have a high-performance visual storytelling asset to bring in more prospects. Starting at $40/month, you’ll gain full access to their platform. In an earlier blog post on easily creating rich video ads, we showed how much better video ads perform than static ads on social media. In fact, our video advertising testing showed that we could garner over 8,000 video views from a target audience, for $300. Visual storytelling through video ads is a fantastic way of getting new prospects into the top of your content funnel. Kylie Ora Lobell writes for brands, blogs and print publications. She covers content marketing, digital marketing and Judaism.